Since I wrote last week's log the winter has returned and we have had a good 30cms of snow and temperatures down to -9C so there is not much to see outside except snow. 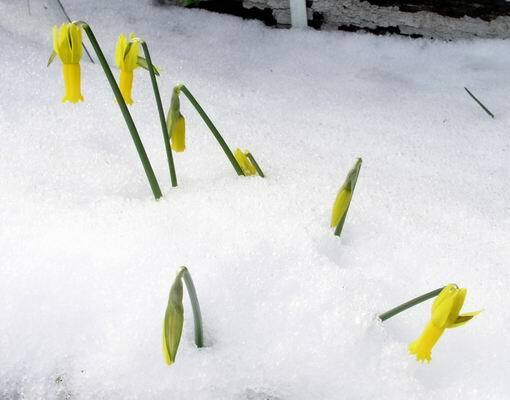 The crocus in the garden made a brave effort to keep their flowers showing but by the next day they also had disappeared to wait for the thaw. 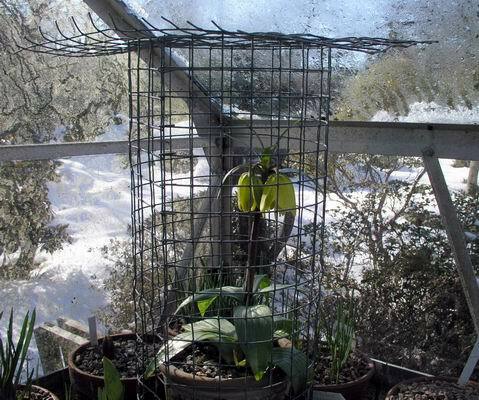 Just as well that I put some covers on the seed frames as there are many monocots germinating and being buried in freezing snow is not the best introduction to life for the delicate single leaf they put up in their first year. 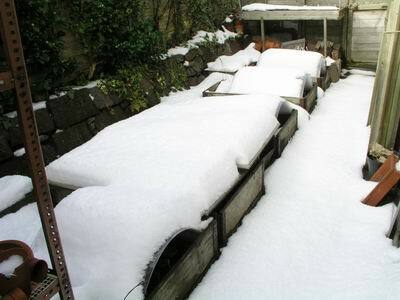 I took this picture after the first snow fall, with the subsequent snow you cannot even see the wooden sides. The one good thing about this cold snap is that we always get a better germination of seed (not just bulb seed) after a good cold period with snow. 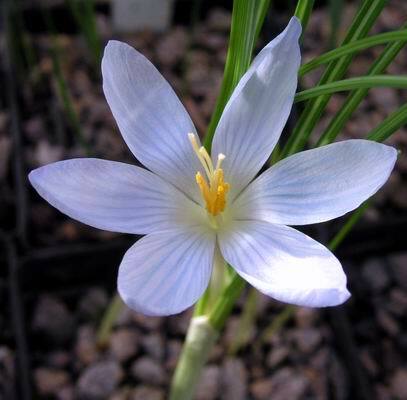 There is no need to worry as most of these early flowering bulbs are well used to surviving this sort of treatment, as it can happen to them in their natural homeland as well as in the garden. Back under glass there is a lot to look, at like the variation in the flowers of these Narcissus cyclamineus, raised from our own garden-collected seed. As well as the range of size and height the tubes vary from very long and narrow to short and tubby and the degree or frilling around the mouth also varies. 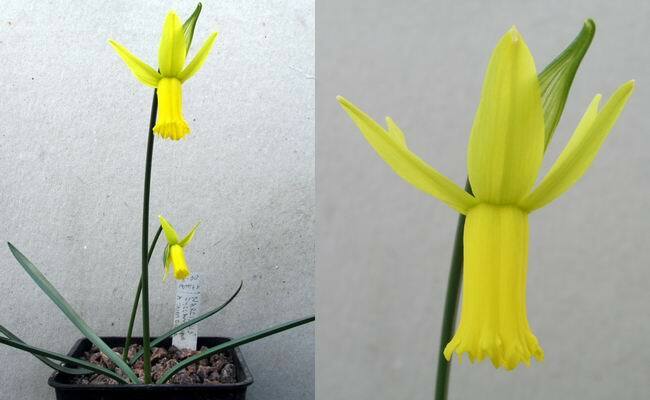 Narcissus cyclamineus x mini cycla. Narcissus cyclamineus also makes a very good seed parent when hybridising and this is the first flowering of a cross that I made with N. Mini Cycla - it only produced three seeds which were sown in August 2000. I am not sure yet whether the difference in size is a fixed characteristic or just one bulb is smaller than the other, I should know next year. This cross is very similar to the pollen parent, N. Mini Cycla, but I hope that it may prove more vigorous and robust as a garden plant, as I find N. Mini Cycla a bit temperamental. 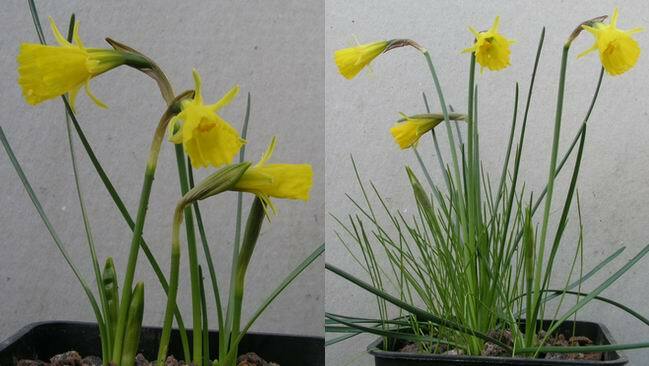 This is my version of Narcissus x Susannae, the naturally occurring hybrid between Narcissus triandrus and N. cantabricus, it is one of the most beautiful narcissus that I have ever seen. I made the cross in 1994. 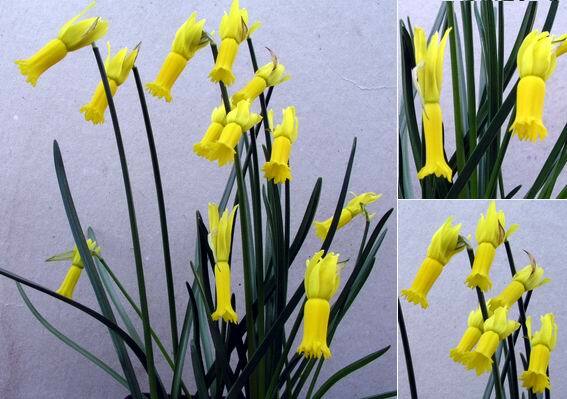 When the bulbs are mature and growing well the stems produce two flowers, the second one opening just as the first goes over, it is also increasing reasonably well by natural division of the bulb and I was reluctantly persuaded to distribute a few last summer. 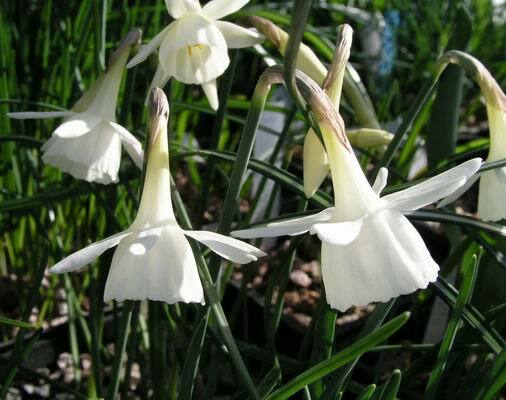 Another of my favourite dwarf Narcissus is asturiensis. On the left is a form , Navarre, originally collected by Gathorne Hardy from the Sierra de Andrea in 1937 but it is the wee beauty on the right with its big flowers and very short stem that captivates me. It is N asturiensis ssp vasconicus (MS 474). 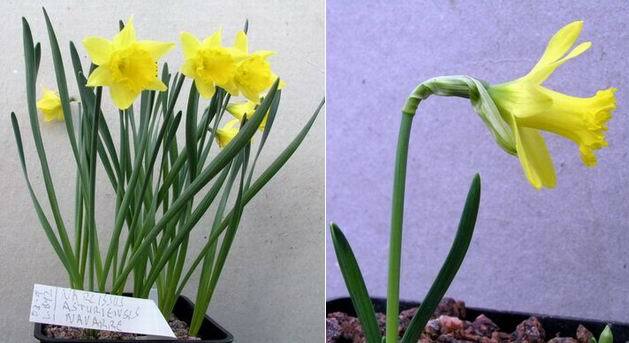 Two early flowering Narcissus bulbicodium: on the left is Narcissus bulbicodium ssp nivalis from the Sierra de Credos in Spain. The slightly taller on the right is Narcissus bulbicodium collected in Portugal - you will also notice that I have sown the seed in the same pot as the mature bulbs of this one in an attempt to save space. Crocus baytopiorum has this lovely delicate shade of blue it is not the easiest of crocus to grow but I have just been told by a friend that she has seen a lovely clump growing and flowering to perfection in a cold garden in Aberdeenshire so I am going to put half of mine into the garden. 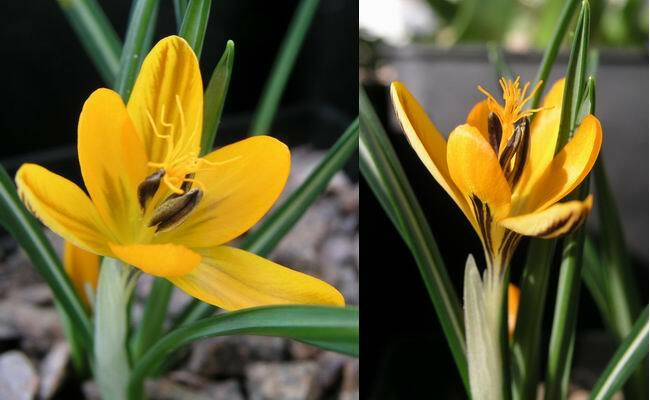 Two shots of Crocus vitallinus OS1283, from Southern Turkey South to the Lebanon, which can apparently flower in the late autumn or early spring ( ours is a spring version). In the small group of seedlings that we have, this is the only one with the dark feathering on the petals the others are all yellow - notice the very frilly stigma. I love the 'I have just washed it and cannot do a thing with it' look ! If you have read all last year's logs you will remember the disaster that befell our single mature plant of Fritillaria chitralensis - a blacbird snapped off the stem bearing three developing seed pods. Well I am taking no chances this year I am determined to get some more seed from one of the rarest Frits in cultivation.